Living religion: rituals are an important part of religious Tibetans' everyday life. 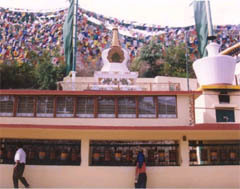 Tibetan Main Temple at Dharamsala, India. Home to nearly 15,000 Tibetan refugees in India's mountainous state Himachal Pradesh, Dharamsala is becoming world's busy spiritual pilgrims' destination. Tibetan Buddhism is the new fad with the spirituality-shoppers who flock to this "Little Lhasa in India." The place got famous after the exiled Tibetan spiritual leader, the Dalai Lama, got Nobel Prize for peace in 1989. With Tibetan image becoming popular worldwide, anything with Tibetan tag is a big business here. Ready-made variety of spiritual experiences is the packaged deal. Advertisements of courses in Buddhist spirituality, meditation and philosophy cluttering the walls in Dharamsala overshadow a few posters exhorting boycott of Chinese-made goods and seeking Tibet's freedom. 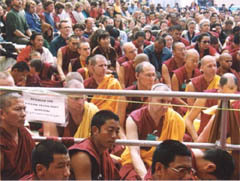 Foreign tourists with freshly tonsured heads (some in newly acquired maroon Buddhist robes) make a beeline to attend philosophy and meditation classes. Squatting in the dimly-lit incense-smoked rooms, and struggling to chant in Tibetan language some ‘mantras' after the Lama's voice—is the scene they love to be in. 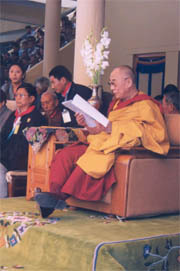 Charismatic aura: Tibetan exiled spiritual leader, the Dalai Lama, is the main attraction with world's spirituality seekers. Dharamsala, India. Thubten Samphel, Information Secretary with the Tibetan Government-in-Exile sees the commercialization of Buddhist spirituality in a larger context, "The materialistic western world finds itself in a spiritual vacuum and looks towards the east; and it becomes a demand-and-supply kind of thing. It's sad, but you can't prevent people's greed to make more money." Thubten even justifies this ‘flirtation' with Tibetan Buddhism as it is politically desirable, "It all may seem commercial but it is an opportunity for us to make the world aware of what's happening in Tibet. There are foreigners who have supported our cause of Tibet's liberation, only after taking interest in Tibetan Buddhism, wisdom and culture." But many Tibetan Lamas find presenting a romanticized view of Tibetan culture and Buddhism as "deplorable and crazy." "Buddhism is a very deep and intensive religion," says Tenzin Kunga, a young monk at Tse Chok Ling Monastery. "Foreign tourists after attending a 3-4 day course, consider themselves to be the masters of religion. It's ridiculous. They have made Buddhism a fashionable commodity." Tyler Dewar, 24, a Canadian studying Buddhism for the last two-and-half years in Dharamsala, sums up the scenario, "I think most foreigners are testing waters or may be looking for some entertainment through spiritual experimentation. Moreover, they also need to fill time in a remote country." Admitting spiritual starvation of the west Tyler explains, "The young people in the west find Buddhism and other eastern religions attractive as they are not authoritative like some other religions." Hence, attracted by the charismatic Tibetan spiritual leader, the Dalai Lama, and Tibetan Buddhism, the spirituality-shoppers from world over land in Dharamsala. Dalai Lama himself holds annual spiritual teachings which are favourite with the westerners. Tibetan Government in Exile offers courses in Buddhist philosophy at nominal prices. Only these courses have some amount of seriousness. The other private spirituality-shops that have mushroomed all over the town seek to rake moolah, religiously. Spiritual healers, Yoga and Reiki masters have also joined the bandwagon, lured by lucre. New life: the tourists with freshly tonsured heads and maroon robes at a Dalai Lama's religious teaching session in Dharamsala, India. An old monk R.Tsering blames the spirituality-shops for undermining Buddhism as a religion, "Many people have opened spiritual shops to fleece the foreigners. And they offer religion like a new dish. In the race for money religion becomes secondary, and the sanctity is lost." But for those making business of religion, sanctity lies in making more profits. They promise and tempt foreign tourists with ‘complete awakening', ‘spiritual clarity' or ‘multi-dimensional vision' in this unusual spiritual pilgrims' destination. The only enlightenment the naïve seekers may get, from the roadside spiritual gurus is in the lighter weight of their wallets. Some may experience certain spiritual awakening, most return as dry as they had come, even disillusioned.